Artichokes "City Style" - Aginares a la Polita. Greeks refer to the former Constantinople as “The City” (polis) and to the style and flavors of the cooking that emerged from there as “of the city” or “city-style.” (a la polita). 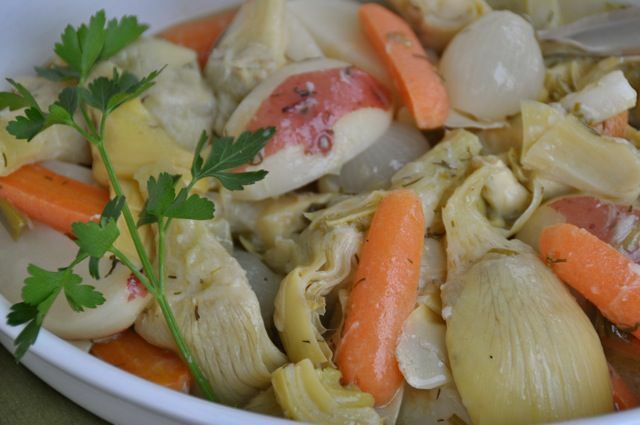 Aginares a la Polita or Artichokes City-Style is a vegetarian stew with artichokes, carrots, and potatoes highlighted by the flavors of lemon and dill. Serve this as a main course or as a delicious side dish. This also makes a great Lenten entree. Add the green onions and saute until tender, about 5 minutes. Add the pearl onions, carrots, and new potatoes and continue to saute the vegetables another 5 minutes. Add the 2 tbsp. flour to the pot and mix well. Cook the flour about a minute or two stirring constantly. Add the lemon juice, broth, water and remaining 1/4 cup oil. Bring the liquid to a boil, reduce heat and simmer covered for about 20 minutes or until the carrots and potatoes are fork tender. Monitor the liquid levels and add a bit of water if needed. Add the artichokes and fresh dill and season with salt and freshly ground black pepper to taste. Cover and simmer an additional 15 minutes or until the artichokes are tender.